Many times we have mentioned how privileged we at Earth Mantra feel to be able to meet artists with whom we are unfamiliar, and to bring their music to our audience. 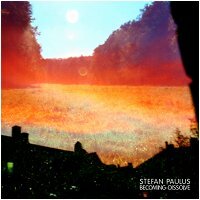 Today we have just such a privilege, as we present Stefan Paulus and his new release Becoming-Dissolve. Folks, we have a mighty treat in store for fans of sounds of the darker and more experimental variety. Like some other artists on our roster, Stefan revels in extracting the hidden music inside of recordings of everyday life, but with a focus more on extended field recordings rather than shorter found sounds, somewhat like the difference between a novel and a short story. In his music, Stefan brings to the listener what he calls "psychogeography drifts", ambient journeys that are based on the sounds of extensive travels throughout the world, but morphed into expansive compositions that tease the senses and free the mind to dream. Listeners will note that the music tends towards the experimental, with strong touches of electro-acoustic music and dark, wintry ambience. While listening, we visualize stark vistas of unending glaciers, cold winds cutting across broad expanses of snow, trees without leaves bending under the weight of crystalline ice, trains quietly threading their way through a vast wilderness of white, and mountain peaks jutting majestic through the clouds. The interpretation is in the ear of the beholder, of course, but we find this music both somber and uplifting, both bleak and beautiful, both moving and soothing, a sage encapsulation of all the myriad aspects of our natural and modern world. Truly, Stefan has created some of the finest abstract ambience we have heard in some time, the perfect sort of music for deep contemplation or relaxation by a crackling fire. Superb work by a gifted artist. So it is with great pride that we unveil Becoming-Dissolve, the debut Earth Mantra release by Stefan Paulus. An album that we think is among the top dark ambient releases of 2012, and certainly one we feel our listeners will find quite fulfilling. Highly, highly recommended. "Psychogeography drifts": endless - humans are interrelated with the elements (from inside a train): imperceptible - experiencing that relationship: molecular - the element of water. Everything is interrelated. Just a thought... "Becoming-Dissolve" and "Coast to Coast"(earman 163) interrelate nicely. Thanks.